If you're into Moto GP or just motor sports in general, why not have a stake in each race by signing up to this years Ruff Road Race League. Its free to enter and theres a chance to win a £10 microsoft voucher. Also thanks to the fact BT are sponsors this year there are even more overall & game round prizes. So if you're interested sign up at http://mcn.fantasyleague.com/User.aspx if link isnt showing just google "mcn fantasy road race"
The MCN Fantasy Road Race team that tops the timesheets and has scored the most points at the end of the season will win an unforgettable prize courtesy of BT Sport. The overall winner will receive a trip for two to next year's Moto GP racing in Qatar! The amazing prize includes two grandstand tickets to the Qatar round of the 2015 Moto GP season, plus flights and accomodation. As well as the fantastic first prize, the generous folks at BT Sport are giving out six Game Round prizes. The best performing team in each Game Round will win a pair of tickets for the British Grand Prix! If you're lucky enough to win Game Round 1, 2 or 3 you'll recieve tickets to this year's race, which takes place at Silverstone on 29th to 31st August. The highest points scoring teams in Game Round 4, 5 and 6 will win tickets to next year's edition of the British GP. Wacky Racing all signed up. 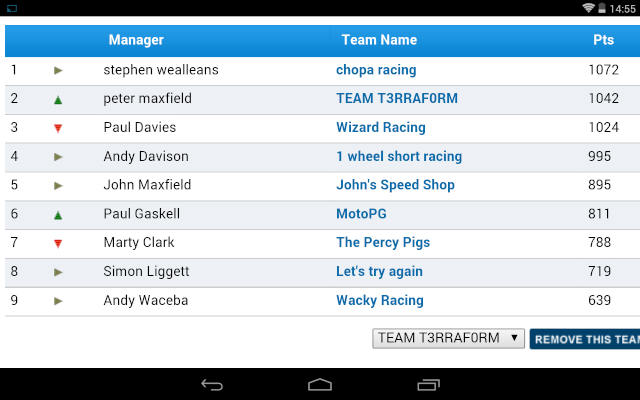 And that is the end of the season for our 1st Ruff Fantasy Road Race League!! A massive well done to BaronChopa for topping the league at the end of the season with Chopa Racing and being crowned the champion for 2014! I would like to thank Ruff Gamer T3RRAF0RM for setting this up, running it and also very kindly putting up the prize of a £10 Xbox Live voucher! BaronChopa also earns a place in the hallowed halls of the Ruff Gaming Hall of Fame - Click to go to the Ruff Gaming Hall of Fame! A massive thanks to everybody that signed up and a giant thanks to T3RRA for the competition and prize!